Slip-resistance is just the start. 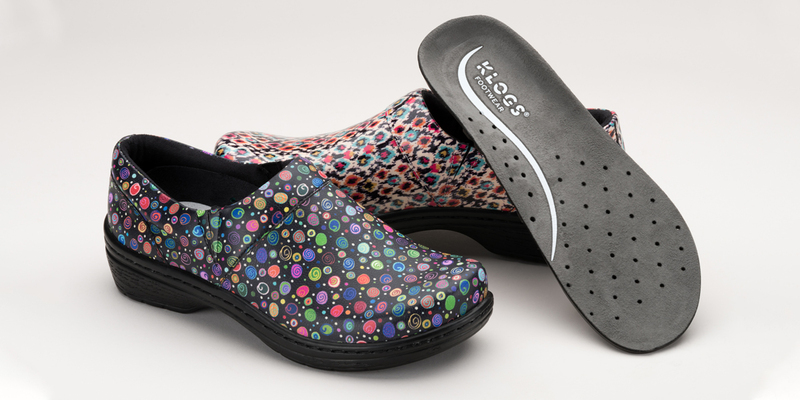 Klogs are durable, easy to clean and provide lasting support and comfort throughout your day. Leena combines sporty style with the same comfort and stability Klogs are known for. With a nurse, you know you’re in good hands. And just as we trust them with our care, nurses trust KLOGS to keep them going throughout the day. Fresh footwear for a fresh season. Express yourself, even in a uniform, with a variety of colors and patterns. WHOSE LIVES ARE TOUGH ON THEIR FEET. We’ve spent decades perfecting our shoes with an outsole and insole that create a harmony of support and comfort, not just for your feet, but your entire body. Healthcare professionals trust our flexible yet durable TRUBase™ Outsole for unrivaled stability and agility and our TRUComfort™ Insole to provide a pain-free experience at work and beyond. Our hospitality collection combines our non-slip PURGrip™ Outsole with our proprietary TRUComfort™ insole to keep you safe and supported shift after shift.